The meteoric rise of the field of Artificial Intelligence (AI) has had a remarkable influence on various aspects of our lives, and this influence is only expected to rise. AI has already disrupted the field of journalism with the introduction of “Algorithmic journalism” (Dorr,2015). Algorithmic journalism involves a “software that automatically produces texts in natural language from structured data.” Various economic reasons are driving the rise of AI within journalism. First, AI spares journalists the time to draft articles and news pieces that are relatively uniform such as daily news reports about the performance of the stock market. AI’s use in editorial tech helps writers and journalists review their pieces promptly. There’s also an argument that AI may help reduce the biases in certain stories, but given that the algorithms drafting the content may itself include the biases of the person who coded them, this argument still has its flaws. In its bid to enhance its ability to reap the fruits of AI in journalism, Reuters has introduced an AI tool called Lynx Insight (Kobie, 2018). This tool aims to augment journalists and writers rather than replace them by providing them with analytical tools that synthesize big data in a way that nurtures their journalistic role. Lynx Insight will analyze a vast amount of data to identify any interesting patterns or topics that can allow Reuters the opportunity to publish content that is innovative and pioneering, and at the same time fits with the readers’ interests. Lynx Insight aggregates the data and sends the journalist a message with a brief about any interesting patterns with some background about the story or topic. The App associated with the tool provides journalists with a live feed of updates regarding any possible breaking news stories. AI’s growing influence in the field of journalism may have significant implications on the future of news and media. 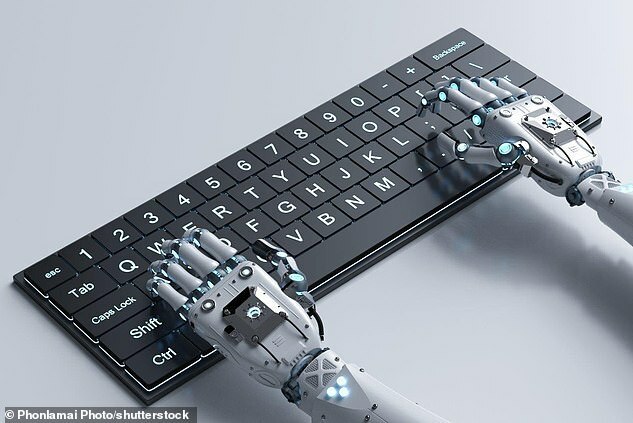 AI may help journalists personalize the news according to the interests of their audience, which may enhance the appeal of the news and its readability. Its ability to reduce the cost may allow new news and media outlets to enter the field which supports the democratization of the field and may provide a competition that can support the quality of the content. Unfortunately, this competition may also lead to the deterioration of the content with news outlets fixated on competition and monetizing content rather than nurturing the field and improving its appeal. Over-dependence on AI tools such as Lynx Insight may reduce the journalist’s sense of agency and innovation ability. This dependence may be destructive to the field of journalism if there are issues with the algorithm, or if the data used by AI has significant flaws. Kobie, N. (2018, March 10). Reuters is taking a big gamble on AI-supported journalism. Retrieved February 12, 2019, from https://www.wired.co.uk/article/reuters-artificial-intelligence-journalism-newsroom-ai-lynx-insight Seth, C. (2016). Mapping the human–machine divide in journalism. The SAGE handbook of digital journalism, 341. Shorthand is a platform that enables simple yet stunning visual storytelling for journalists, artists, statisticians, and any storyteller looking to explore dynamic digital means of telling their tales. In a time when empathy and compassion often feel scarce, storytelling with tools like Shorthand re-engage the emotion of an often jaded audience through paced, intentional, and visually dynamic storytelling. Over the course of my time in academia, I have become quite in touch with how little I know. Everyday, actually, the pool of knowledge, the bank of content of which I am aware I need to learn gets bigger and bigger. So, naturally, I try to absorb as much knowledge as I can just to combat the growth of that pool of uncertainty, but the rate of understanding is always slower than the rate It feels like a sprint, one where I can see the end, but the faster I go, the farther away the end gets. It is an absolute race to learn as much as possible as quickly as possible. In that spirit of panic learning, I have become an avid speed-reader. I remember having a deep pride in my ability to speed read, to skim, to find the gold nuggets of information in a sea of text at school. The structure of the piece? I know it like the back of my hand and could find the heart of it blindfolded. Anecdotes? Fables? Stories? Merely obstacles on my mission to dig up the seed of ground-truth planted and hidden deep within the essays of the old men of antiquity. But with so much practice in my race for information consumption, out of repetition, habit, and training, I have a really hard time not speed reading. My group, the Lab for Social Machines, is working on a project called the Local Voices Network. It is constituted of a “unique physical-digital network designed to bring under-heard community voices, perspectives and stories to the center of a healthier public dialogue.” In short, we have a lot of audio of people telling stories from their lives. As a part of my research, I’ve been reading the transcripts of these people’s stories. Some are deeply personal, raw, and emotional. Yet, while reading, I’ve found myself flying through them, zooming through the details, feeling little empathy or any emotion at all, only looking at it through an academic lens racing to find the key nuggets of information. And what a disrespect and disservice to those storytellers. I’ve found now, that when I listen to the audio of those stories, slow down, hear them word for word, hear the emotion in their voice, do I feel some emotional tug. I believe that is a key problem with media consumption in American democracy today: often, we feel little empathy, no compassion, and no emotion when we read or see stories that should be truly moving. Of course, how the story is told plays a primary role in the consumer’s interpretation and the emotion they feel. However, I believe the medium is also key. In order to feel more empathy and compassion when taking in stories, I’ve tried to give more attention to the emotionally stirring mediums. I’ve found them to be longform, often audio or video based, more based in detail, characters and humans, images, key moments, and so on. In these formats, we humanize the people in the story, feel their pain, visualize their circumstances, feel the emotion in the voice of the speaker, and empathize. In my experience, I have found it to be more rare for text based stories to offer that same punch, both due to my incessant speed reading and the sometimes one-dimensional nature of the text I read (often news, often academic, and often cold). Shorthand enables text based stories to paces the reader and allows for easy, efficient, but stunning and deeply impactful visual storytelling. The visual storytelling of Shorthand allows artists, data visualizationists(? ), storytellers, journalists, scientists, and whoever to collaborate on teams to tell a story that engages the reader. This collaboration enables illustration, photography, video, and data visualization to be enhanced by beautiful and informative language, and enriches traditional text-based stories, pushing them into a second or third dimension of communication. The slow and intentional spacing of a story segmented not by paragraphs but by the consumer’s scroll rate allow for the writer to place emphasis on a single moment, a single image, a single line of text in a way reminiscent of to oral storytellers when they hit the climax, a moment of suspense, or a key moment of loss. No longer can you zoom through a moment, zoom through a visualization, take only what you want to from the peice. Rather, the writer has a bit more control over what moments stick out in your mind as important, influential, and meaningful. I’ve attached examples of stories that use illustration to promote empathy and emotion in stories whos punch can be diluted by news outlets, stories that break down data visualizations into more consumable packages, moments where Shorthand has been used for advocacy, and a visual artist who has incorporated Shorthand into their art to create an array of stunning self portraits. Finally, Shorthand is incredibly easy to use. I’ve linked one I’ve created about croissants here that took me less than 10 minutes. They offer extensive tips on general storytelling and how to use their tool on their page, The Craft, that is useful for those who use the platform as well as for those who choose not to. The platform is not free (but offers a free 30 day trial if you want to check it out). Overall, I would highly recommend this tool and other tools and media like it to re-engage emotionally distant or jaded audiences to reinvigorate and bring passion, emotion, compassion, empathy etc. back to what can sometimes feel like a dying or apathetic democracy. Geosearch has been around for a while; Echosec, present in a 2016 list of tools for journalists, is branded as a private security / “Open Source INTelligence” platform. With blog posts like “Social Media for Executive Protection” from 2015 and “How Executive Protection Services are Changing” from 2018, they’ve clearly found their niche, and since the time list of tools was written have stopped offering their tools to non-customers. 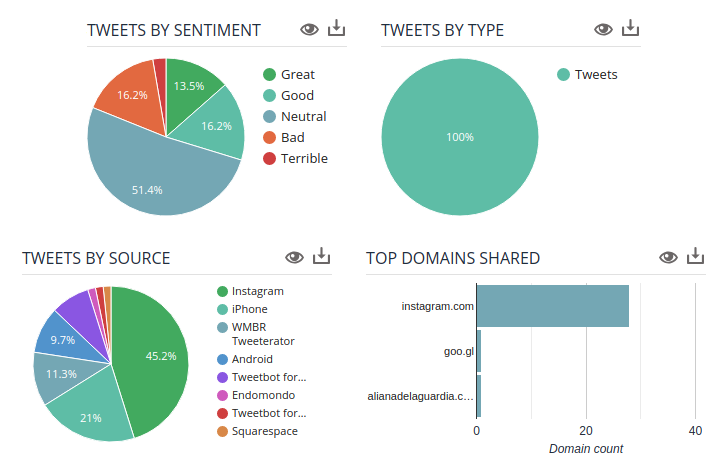 Socialbearing’s map interface, selecting a tweet considered to have a strongly negative sentiment (it doesn’t). Socialbearing, on the other hand, focuses on marketing feedback; “insights and analytics”, “sentiment analysis”, and “View top influencers” are their key features. Google Analytics is a clear visual influence (see image). Their product, thankfully, is still available, and even makes some noise about randomizing location markers to protect privacy. Socialbearing’s interface. It’s always good to see that tweets, by Type, are 100% Tweets. Journalists can obviously benefit from such tools in myriad ways, most obviously when covering chaotic live events such as a protest, riot, natural disaster, police scene, etc.. Historical searches provide a way to compare locations at a particular time, or track a location over time, providing the oppourtunity for spatially-rich narratives of an event. But what are the implications of these tools? The breadth of interest in them, combined with the impression that they’re somehow more “real” than twitter (anything on a map is easy to imagine as having already truly happened), makes them an interesting vector for malinformation. Building a fake twitter account that could plausibly be in a particular location takes a different kind of work than your standard fake account, but it probably doesn’t need as many followers/follows to be noticed, and so may be more resilient to discovery attempts. 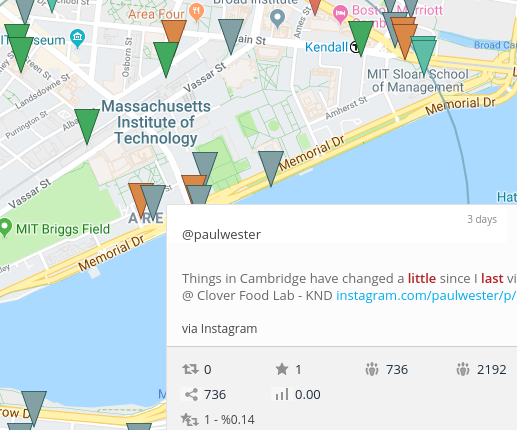 Journalists using these tools may wish to practice a kind of “shadow analysis” to verify whether the incidental information of these tweets and accounts is sufficient to verify a highly spoofable GPS entry. What I find most intriguing, however, is the perspective these tools offer to the user. By helicoptering the journalist over mapped landscapes and letting them look down to spot individual tweets, they make the user feel powerful, godlike. The world seems understandable, and certainly the streets are understandable in a way they wouldn’t be from the ground during a protest, riot, or natural disaster. While the journalist is already in a position of being at their computer and not on the ground, I feel like geosearches heighten that feeling of distance even more than looking at a stream of text does, and that concerns me. This flyover perspective seems like something that could easily creep into the tone of how something is covered, giving it a strong spin even in the absence of malinformation. EDIT: this only occurred to me just now in class, but while I saw several posts on “drone journalism” which meant by it using drones for photography, this kind of investigation by signature strike truly seems like journalism coming from the tradition of the drone, with many of the same strengths, the same weaknesses, the same fraught tradeoffs. #YourDataStories is an online platform that provides an insightful set of resources for journalists to help them hold governments accountable regarding public expenditure. Designed as a tool to provide a deep understanding of open public data for both journalists and citizens, it allows for constructive storytelling in a user-friendly manner. The project brings together journalists and data experts to search, analyze and explore publicly available data to extract insights, facts and material to shape and back up their data stories. The YDS platform allows users to browse through and analyze datasets from various sources, which have been already aligned, interlinked and unified under a common vocabulary. The simple visual approach of YDS makes it possible for journalists and less skilled data researchers to delve into the data from any possible aspect and perspective finding new angles for analysis and interpretation. The all-in-one workflow lets users go straight from finding the data to publishing their story. YDS brings data from different sources together to complement and eventually enrich a story. Open governmental data sets can be used to tell interesting stories and reveal patterns related to public expenditure. It serves as a camvas that enables journalists and citizens to trace hidden stories in data. While still in a developing stage, the platform serves as a toolkit for journalists to identify, investigate and create news stories. If you were tasked with reviewing and making sense of a huge stack of documents you’ve never seen before, you would probably go about it in a pretty standard way. Skim the first page and make a quick decision about whether it’s relevant or about a specific topic, then move to page two and make that decision again. After a few pages, you might have a few separate piles describing what you’ve seen so far. As you continue reading, the piles might get more sophisticated. In one pile, you might place emails containing specific complaints to the school board. In another, policy proposals from a public official’s top adviser. On and on you go until you get through enough of the pile to have a fairly good idea of what’s inside. For investigative journalists reviewing massive document dumps — responses to public records requests, for example — this may be one of the very first steps in the reporting process. The faster reporters understand what they have, the faster they can decide whether there’s a story worth digging into. Making sense of documents as efficiently as possible is the primary purpose of Overview, an open-source tool originally developed by The Associated Press and funded by a collection of grants from the Knight Foundation and Google, among others. Upload your documents into Overview and it will automatically process them first using optical character recognition. It then uses a clustering algorithm called term frequency-inverse document frequency to try to sort each individual document into a series of piles. It’s somewhat similar to the way a human reporter would sort documents if she were reading the pages one by one. TF-IDF is built on a really basic assumption. It counts the number of times each word is used in each document — say a single email in a batch of thousands. It then compares those counts to the number of times the same words are used in the larger collection of documents. If a few of the emails have words in common that are relatively uncommon in the whole collection of emails, the assumption is that those documents are related in some way. Overview doesn’t actually derive any meaning from the words it’s counting, so the assumption the algorithm makes about documents being related might be wrong or totally unhelpful. But Overview also allows users to tag individual documents (or whole piles) with custom labels. It might, for example, help a reporter more quickly identify those complaints to the school board or the policy proposals to the public official because they’re all grouped together by the algorithm. Overview has a few other helpful features, like fast searching and the ability to rerun the clustering algorithm with different parameters — specific terms of interest or stop words, for example. It’s also seamlessly integrated with another tool called DocumentCloud, a popular platform journalists use to annotate and publish documents online. I’m pretty new at making podcasts. It’s not always easy when English is not your first language. Especially the transcription! If I had to do it myself by hand, it would take ages before I start editing. But with a help from some tools, I can edit and produce podcasts without a pain. I’ve only used the first one, but saw a demo for the second one at ONA last year, which was impressive. Pop-up archive is a good for transcribing audio material. The accuracy is pretty good and I love the timestamping features. Trint is a tool for transcribing audio and video material. It also has timestamping features with a function to adjust. The text can be also adjusted. You can also highlight the segment you want to use and it automatically tells you the time duration of the selected part. FYI, in case of audio/video production, I always listen or watch the entire raw material of the interview. Even you have everything transcribed, it is just a guide for editing. Find the best part of the interview using your own eyes and ears!